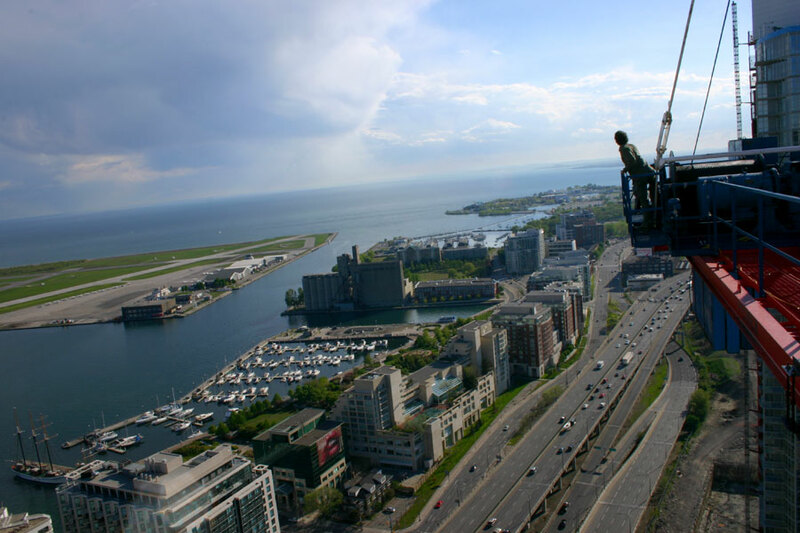 The author, atop a crane in Block 3 of City Place Toronto, west of the Skydome and CN Tower complex, in the summer of 2005. A few weeks ago, those responsible for maintaining the relevance of Toronto's sky needle announced that later this summer they would pioneer a thrilling new attraction. On offer, they say, will be the opportunity to leave the safe confines of its concrete and steel structure and walk—tethered and supervised by experts—to the edge of the roof of the CN Tower's main pod. It should not be surprising that someone would think to offer this—at the very least, shows like The Amazing Race have supported the development of the pool of skilled oversight and idiot-proof equipment necessary for the attraction. We are better off asking if we should be surprised that it is happening here, in risk-averse Toronto. The answer again is probably no. 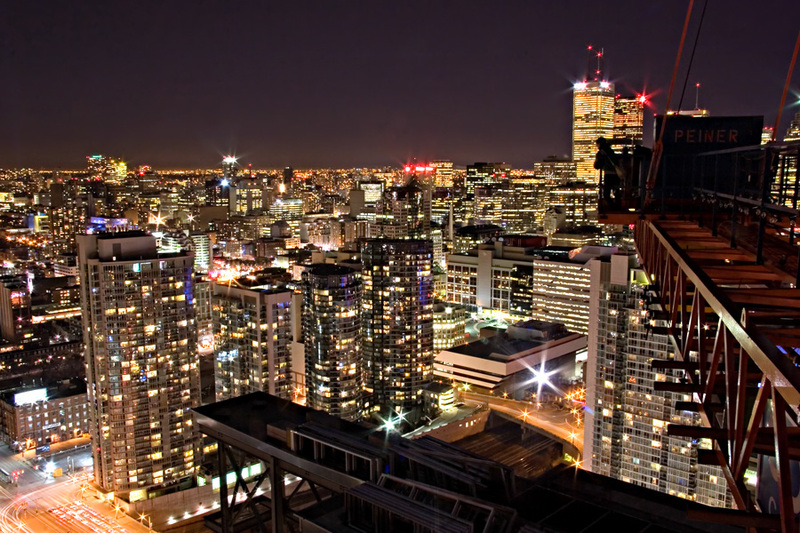 More than in any other Canadian city, an increasing number of us experience Toronto as a vertical city. This is not just a statement about the downtown condo boom either: keep in mind that the outer boroughs have been seeing a similar ramp up of new tower projects to pad the constellations of vintage concrete towers that already line the major arterials of North York and parts of Etobicoke and Scarborough. 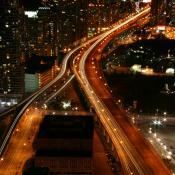 Yet the reality of vertical living is leading to all kinds of other culture changes. 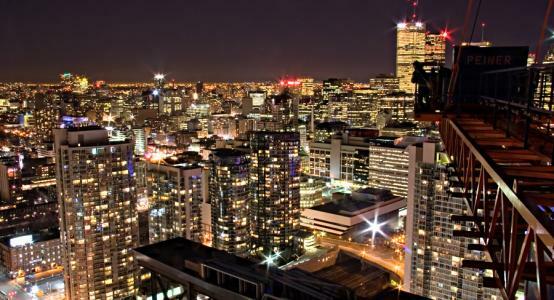 The writer and humorist Stephen Leacock apparently said in the '40s that Toronto was a city you couldn't see, that "when you are downtown you can't see uptown, and when you are uptown you can't see downtown, and both uptown and downtown can't see sideways." Condo living presents a revolutionary overthrow of these constraints. But the vertical city is all private space. For a few hundred grand, you can have your 550 sq. foot box in the sky, and you can invite your friends over to hang out and see the sun set beyond the end of the Gardiner. Still, you can't have a public experience there, and that remains something that many of us crave. 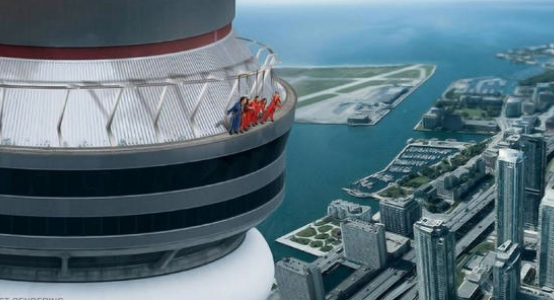 Artist's rendering of the CN Tower's planned EdgeWalk attraction. The stuntman Dar Robinson made two jumps from this same ledge in 1979 and 1980. You can skydive for $175, once you get the more expensive training out of the way, and you can take an entire family up to the amusement park in Vaughan for that price, but those are both exurban experiences. The opportunity to physically and sensorially challenge the city is something that many of us crave, but until now it has been a desire that the people who manage and do business in this city have done a particularly poor job of fulfilling. The annual charity climbs, which for more than two decades have sent thousands of participants up the CN Tower's emergency access stairs to raise money for the World Wildlife Fund, United Way and other causes, are recognizeable precursors for EdgeWalk. In many ways, and despite being highly choreographed for safety reasons, these charity climbs are the most freewheeling, participatory activity Torontonians have ever been given official permission to undertake in the city's skyline. Beyond its obvious thrill aspect, EdgeWalk seeks to tap into the same craving that makes the charity climbs such popular undertakings. While it is certainly priced to make money, EdgeWalk also needs to be understood as the latest in a series of efforts by the tower's management team to renew its relevance within the city's skyline and as a destination for tourists and local residents. Like the dynamic LED lighting scheme installed over extensive parts of the tower's exterior in 2007, EdgeWalk is as much a performance for the surrounding city as it will be for its paying customers, an effort to renegotiate how we view what was once the world's tallest freestanding structure. The CN Tower has already seen its share of edge-work reconfigurations of its place in the skyline over the years, not all of them authorized. In 1975, before construction was even completed, one of the tower's ironworkers made an unauthorized parachute jump off of what was then the top of the structure (the story is told in "The Ballad of Sweet William," a fantastic animated musical short). A few years later, the stuntman Dar Robinson made two authorized jumps from the pod—first with a parachute for the Christopher Plummer film High Point, and then again in 1980, this time for a television documentary and using only a wire system to arrest his fall (both jumps are shown in this Chuck Norris-narrated video). More recently, two Greenpeace activists ascended 340 metres up maintenance scaffold wires in 2001 to hang a banner decrying Canada's laggardly response to climate change. Last year, internet viewers were enthralled when a communications technician named Patrick Thompson posted a video shot in 2006 during maintenance work at the very top of the tower's transmission mast. All these events capture our imagination in ways that the tower's stale observation decks fail to do, at least not as expensive, ticketed experiences. Given that the tower's 1976 opening encouraged the closure of public observatories on a number of other downtown buildings, there's a certain irony that there's a greater excitement today for the occasional Doors Open-facilitated opening of one of those shuttered decks, with their obstructed views and limited altitudes, than there is for the heady, perfect views on offer up the CN Tower. 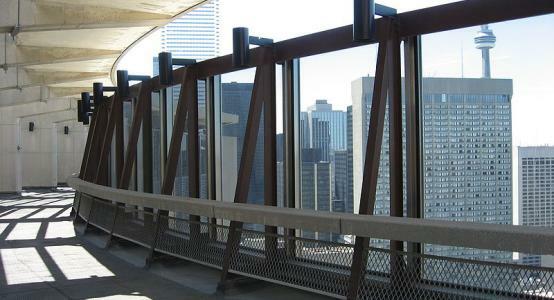 Toronto City Hall's observation deck, located on the 27th floor of the complex's East Tower. Photograph by Padraic Ryan, from Wikimedia Commons. 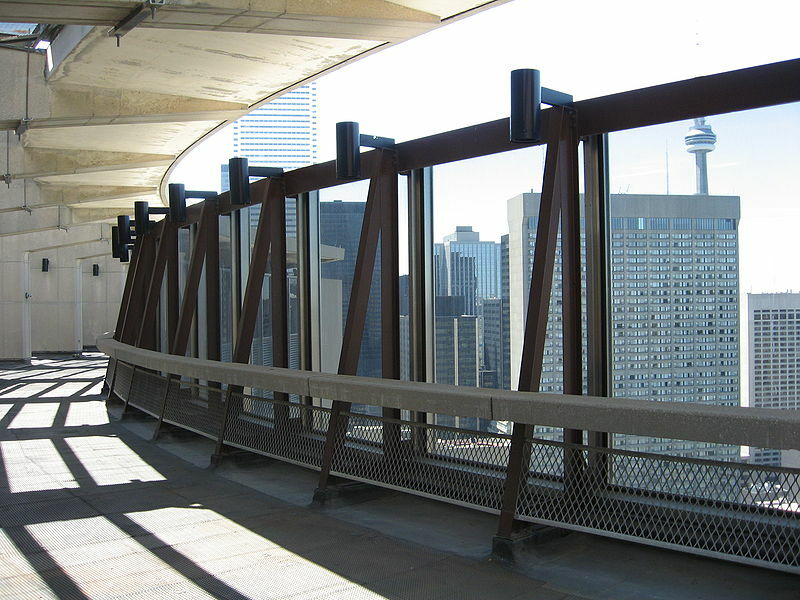 When Toronto was a modernizing city, from the 1920s through the 1960s, the public observation deck was treated almost as a zoning requirement. The New City Hall (1965) has one, long off-limits on the East Tower's 27th Floor. The former Imperial Oil tower (1957) on St. Clair Avenue, now being converted to condos, is topped with an observation level that was once the highest point in Toronto. The North tower (1931) at Commerce Court, itself once the tallest building in all of the British Empire, has an exposed observation deck framed by incredible stone faces. The Toronto-Dominion Bank Tower (1969) was topped with a spacious public observation deck on the floor above Canoe. Its closure in 1977 was especially regrettable since it also displaced TD's fantastic collection of Inuit art, one of the building's early management's extra efforts to make its top floor into something resembling a multi-dimensional public space. The modern West Tower (1972) at Commerce Court had an observation deck as well, which for a few brief years gave visitors the unusual opportunity to gaze a few floors down at the Toronto-Dominion deck on the other side of Bay Street. When the 1960s ended, even in the last twenty years as Toronto was experiencing its incredible vertical resurgence, we stopped building new observation decks. Operating costs, liability concerns, and disinterest on the part of building owners and public alike led to the gradual closure of all but the ones atop the CN Tower. There are a few restaurants and lounges sat atop towers around the core: these include the aforementioned Canoe, the CN Tower's own rotating restaurant, and several hotels. The Manulife Centre at Bay and Bloor has hosted a bar on its 51st floor since it opened in 1974; the view from the top was enough to convert a Calgary Herald writer who visited in 1979 and returned to Cowtown to gush about our trees, our sailboats, and just "how plain beautiful Toronto is." You can of course still pay $20 to simply ride the elevator to the CN Tower's viewing areas, but I would not blame residents who weigh that price, along with the tourist trappings that accompany it, against the opportunity to stand for a few minutes behind a wall of thick netting, and choose instead to spend the day in a park. There the sightlines may be more limited, but the possibilities for collaboration, discovery and adventure are left far more open. And once the whizbang! aspect of EdgeWalk passes, it will probably fail our collective imagination in the same way we are failed by the observation decks below it. Part of the reason Toronto's old observation decks were forgotten, and why the CN Tower continues its own struggle with relevancy is that, once the excitement of the new city and the chance to be part of its creation were behind us, all each of these platforms offered was an opportunity to be spectators. What people crave today is the opportunity to participate socially and physically in imagining the city that they live in. This is why Doors Open remains so resoundingly popular year after year, and why the CN Tower will make good money selling people the opportunity to 'challenge their fears' with a Fear Factor-style experience of imaginary risk-taking. I suspect that they could do just as well selling people the chance to power-wash the roof of the pod, to squeegee the windows on the outside of the elevator shaft or to duplicate Patrick Thompson's ascent to the tip of the mast to check the lightning rods and navigation lights. People want the chance to interact with the city's skyline, and in the absence of an affordable and authorized alternative, in the last decade or so they've been doing it themselves. 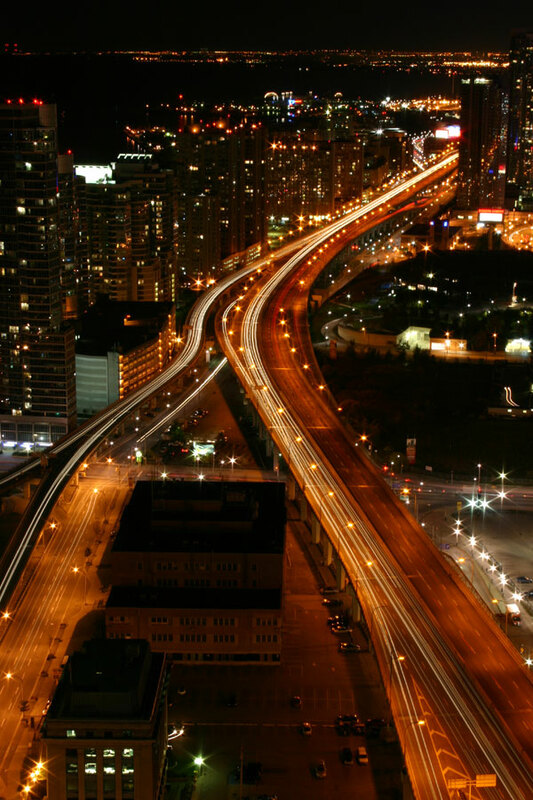 Many readers will be familiar with some of the law-agnostic activities pioneered in 1990s Toronto by the late Ninjalicious and his Infiltration 'zine, which many times took him to off-limits rooftops and observation decks throughout the city. 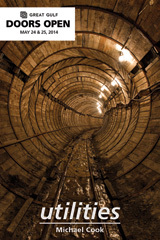 The engagement with the urban environment that he trailblazed has since been subsumed into the catch-all 'urban exploration' hobby that is now practiced by a wider audience of internet-enabled participants across the continent. Less visible within that contemporary buzz of camera-happy daytripping to the Hearn station or the Brickworks has been the growing popularity of summiting Toronto’s unfinished condos and their accompanying tower cranes. 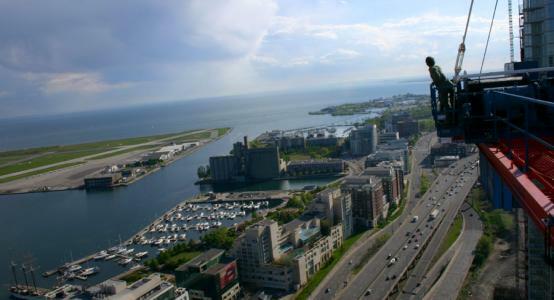 In 2007, local filmmaker Peter Riddihough did release Jump, a documentary chronicling the exploits and motivations of a small cadre of urban BASE jumpers, for whom Toronto's new condo towers were both an irresistible forbidden fruit and a laborious task around which the rest of their lives were organized. Despite the hobby's first impression as a throw-caution-to-the-wind activity, BASE jumping as a long-term practice involves meticulous preparation, extensive scouting and an intense degree of planning, efforts wholly out of proportion to the few seconds of direct thrill the participants enjoy. The film leaves the viewer torn between interpreting the activity as a questionable, though largely harmless addiction, or considering its deeper implications about the jumpers' intimate, ritualized relationship with the evolving physical and social form of the city. 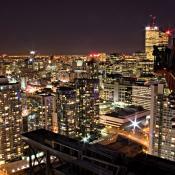 More recently, Torontoist regaled us last autumn with a breathless feature about ‘sky pirates’, their term for a loose group of crane-climbing photographers who've become increasingly prolific in capturing unauthorized views of the city from the transient platforms offered by construction tower cranes. And although the flickr groups of Torontoist and BlogTO are lousey with their work product, for the most part these photographers have otherwise stayed below the radar. monkeying out onto the crane’s forward armature, often without any kind of harness or safety line. For these efforts and hazards, they (and I, for a time a few years ago) get the chance to put themselves in front of the physical city in a way that we get almost no other opportunity to do. Not behind glass or safety rails, not shepherded by minders, with the sum possibilities of the city in front of us. Being in the foreground is the ultimate appeal of stunt attractions like EdgeWalk too. People who can will pay the money to cavort atop the city in a way that they can't inside the tower's spectator decks. But we will still lack somewhere where we can do this together, without an entry fee or legal peril. And in the meantime, some residents will continue to summit towers not yet occupied. Despite the risks, that's probably a good thing. I wonder if there isn't a worthwhile conversation to be had about what all this crane climbing means to our evolving ideas and values about being and civic space in the city. This is certainly the dimension that was missing in Torontoist's brief feature about the city's leading crane and rooftop photographer, who goes by the moniker 'HI-LITE' and whose own website is well worth a visit (he also visits drains). That Torontoist writer focused on a strained metaphor about sailing ships and pirates, and while to be fair, the way that cranes weathervane in the forty-storey breeze really does feel like the rocking of a ship at sea, the article loses the plot when it drags that metaphor out to encompass the entire undertaking rather than asking some pretty core questions about why we should care about it. To risk my own foray into metaphor, on a simple level these are the mountains that Toronto never had, reincarnations of how it must have felt to travel the Iroquois ridge path before it was eaten up by backyards and front yards and the Davenport Road. Go to Hamilton or Montreal, and their respective 'mountains' give this kind of perspective on the city. So too on Vancouver's Grouse Mountain. They are places where as individuals we get to impose ourselves on an urban landscape that too often imposes itself on us. Toronto has always had great reservoirs of places where people can lose themselves in landscape: the river valleys, the ravines, the margins of our highways and railways, and between them the city's undiminished flatness. We have almost nowhere where we can place ourselves in front of that landscape; only the islands, the spit and the Gardiner Expressway come close. 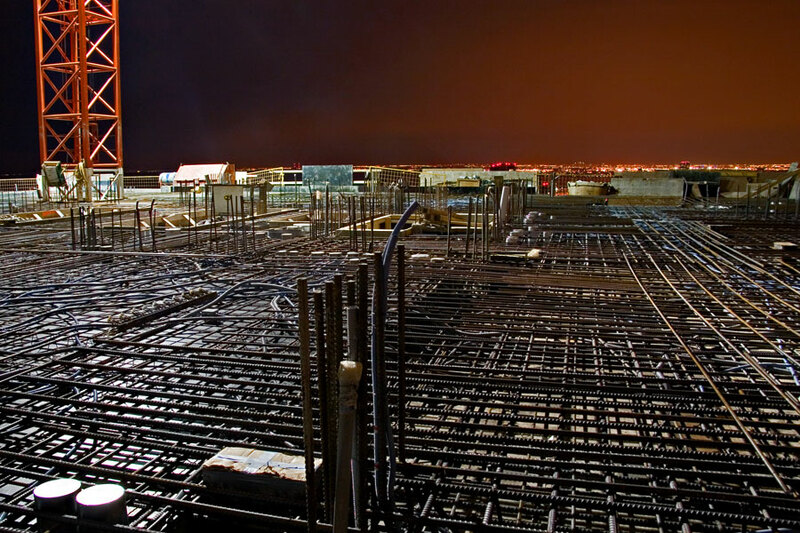 Even our condo suites, with their limitless views, are ultimately an act of disappearing, a great filing system in the sky. Despite thinking that this physical experience is very important in its own right, I know that there are more questions to ask as well. For instance, is there an element of protest in crane climbing, of reasserting the human citizen against the imposition of these often poorly-integrated condos onto our cityscape? After all, at best we have only ever been allowed to vote on these half-assembled towers through our mortgages, and only then with the approval of our creditors. I know that I celebrated when some of the above-mentioned photographers summited the Trump Tower a few months ago, triumphing over the developer's exclusive cachet and the bio-metric security the site imposes on its daily workforce. Most condo towers are far more anonymous, and there is nothing activist about the intentions of most crane climbers. At most I would say that there might be a humanist impulse here. In rooftopping and climbing cranes, there is a bid to give human-scale to buildings that, despite being inhabited by thousands of residents and employees, upon completion become so publicly inaccessible that they might as well be paintings on a backdrop. It's an expansion of the bounds of the city, of what is possible, of how we fit within it, and of what we want to dream the city could be (beyond gawking at cute things, this is also why we get so excited about each year's broods of peregrine chicks). Where they are rooftopping existing buildings, as in hilite's recent trips atop the Sheraton Centre and Eaton Centre, or Ninjalicious' old forays to the roofs of City Hall and the Royal York Hotel, there is also clearly a cachet to occupying and reclaming historic battlements that we've been shut away from. That kind of heritage reward applies even on far more modest structures, like the scaffolded Princes' Gates at the Exhibition. 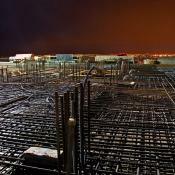 But there is something particularly special and different about new buildings. In the months before a tower reaches completion, while it is still growing skyward and most floors have yet to see their finishings installed, a brief window exists where the condo, its rooftop and the fleeting presence of the crane above it can be made into a kind of expeditionary public space, and one that closely resembles what I think it must have felt like to visit the observation deck at the Bank of Commerce building in the 1930s, at City Hall in the 1960s, and atop the CN Tower in 1976. Crane climbers, on behalf of the larger public, usher new buildings into our shared landscape in a way that promotional renderings, sale brochures and even active residency never can. Like Thompson's CN Tower mast video, crane climbers' photographs are a performance for the public, but instead of showing us places that we are not supposed to be or could never hope to be, they're showing us places that we see every day, a skyline that we remain extremely familiar with, even as it continues to expand. I don't think that this is simple tourism—the crane-spaces are incredibly temporary and interchangeable, and with few exceptions these unfinished buildings are blank slates, offering little of the meaning that you can attach yourself to above more important or sentimental places in the city. What is happening is more on the level of public ritual, but as a challenge to the building's sacredness rather than its confirmation. Whether the view is from the top of an exclusive, $28 million residential penthouse, or a less sought-after mechanical hut, what is being made is a vantage for everyone, a place that anyone can imagine themselves being, a skyline that belongs to all of us. 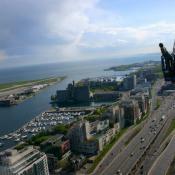 This too is what the CN Tower is aiming to offer with EdgeWalk, albeit with a $175 price tag attached to the experience. I should be clear that I am not encouraging anyone to go climb a crane as the rational alternative to Canada Lands Company's pricing structure, but I am glad that some people are. And maybe we can start thinking about other opportunities to open up and stride across the city's skyline, to challenge not only our fears, as EdgeWalk promises to do, but the possibilities of what the city can be and how we can be within it.